I've ranted and raved before about how much I LOVE Leigh & Luca scarves. Tis true. But then, I rant pretty regularly, so maybe you've learned to tune me out. Well, LISTEN UP, PEOPLE! In case you missed it previously, I'll say it again for good measure: I LOVE Leigh & Luca. I think the scarves are just beautiful and perfectly shaped and awesome. So, when I saw that they were coming out with bags for last season, I was excited to see the results. And, naturally, the bags are super cool too. Especially the above feather bag, which I NEED. NEEEEED. I don't want to drop any hints, but some people's birthdays are coming up, people. Like mine for instance. Is anyone listening? Here's an idea: Get it before it sells out and hold it for a month until Nov. 12. Or 'til whatever day the birthday falls. That's what I'd do. I mean, for someone else, of course. Just saying. It's really my subtlety that keeps me so beloved. WoW!!! 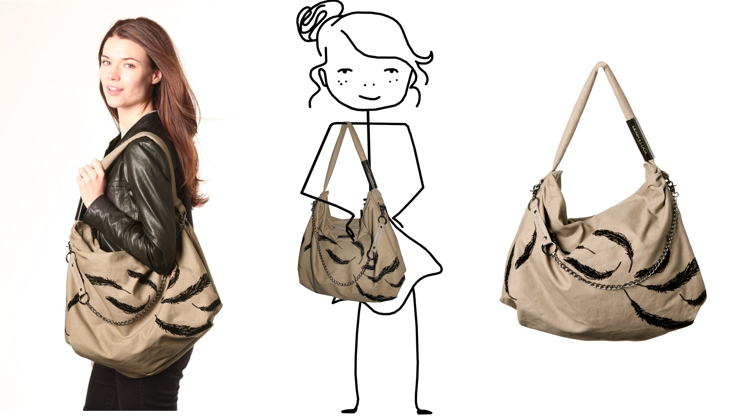 !I love that bag!! !me wanna get this type of bag for myself….Hope this will be the best quality one…http://www.youtube.com/watch?v=mQVTXSgd2Cg the bags are super cool too.. Especially the above feather bag is amazing!!! !